crows feet – These look like 3(or more) little crows toes. They are caused by using the muscles for smiling (obicularis occuli) and by having less fat under the skin in the area to the side of the eyes. They face out from the centre of the eye to the side of the face. They are perfect for anti wrinkle injections and will usually disappear if treated 1-3 times. They actually get a little better with filler on the cheek. 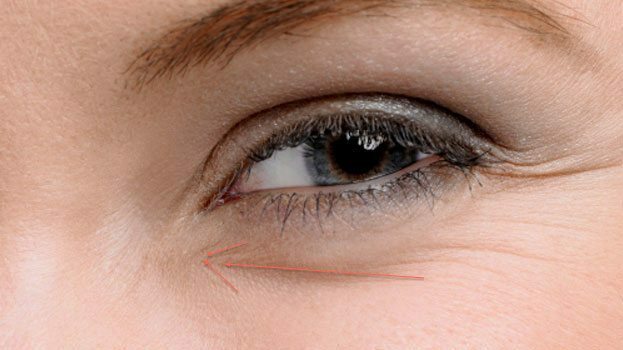 Crows toe – This line is the upper crows foot, which unfortunately is not just caused by using the smile muscles, and not just caused by lack of volume at the side of the face, but is also caused by heaviness of the brows and brow droop pushing down and adding weight to the top line. This single line can be quite deep and may not go with plain old anti wrinkle injections at the side of the eye. Often a ‘brow lift’ is needed to lift the brows a little and soften this persistent bad boy. Hello, I would like to know how do you treat the lines under eyes 3 under eye arrow?? I have searched tirelessly online on how to treat them and have been using expensive eye creams to combat these lines but nothing seems to work. Despite taking good care of the area and applying cream day and night, It seems that they are getting more obvious instead of the other way around. Please help!! Thank you!